The Applied Social Research Institute of Cambodia (ASRIC) is a volunteer organization committed to human and civil rights. Through dialogue and grassroots activism, ASRIC is dedicated to working on issues affecting Cambodia Americans and the Cambodian diaspora at large. ASRIC is steadfast in its commitment to facilitate justice, healing, and reparation for survivors of the Killing Fields where an estimated 1.7 million Cambodians died as a result of execution, starvation, forced labor, and disease. ASRIC has implemented innovative programs since its founding. One such program is the Cambodian Diaspora Victims’ Participation Project (CDVPP), which aims to provide Cambodian American survivors the opportunity to participate in the Extraordinary Chambers in the Courts of Cambodia (ECCC), also commonly referred to as the Khmer Rouge Tribunal. The goal of the project is to work with the communities across the U.S. to transform victims into witnesses and facilitate individual and communal healing through justice. To this end, ASRIC spearheaded outreach and community forums. Since 2009, ASRIC has organized, with community partners, forums in Long Beach, Santa Ana and SanJose, CA, Portland, Oregon, Lowell, MA, Philadelphia, PA, Washington DC, Baltimore, MD and Virginia. Some community collaborations include but are not limited to the following:Cambodian Americans for Human Rights and Democracy (CAHRAD),Cambodian Association of Greater Philadelphia (CAGP), the Khmer Post East-Coast, the Cambodian American Community of Oregon (CACO), and the Cambodian American Family, Inc. These forums raised awareness about the tribunal and collected 170 testimonies (41 civil parties and 129 complainants) from survivors. ASRIC strongly believes it is critical that survivors’ voices are heard. They endured some of the most horrific violations against their human rights under the Khmer Rouge draconian reign from 1975 to 1979. Many of these survivors who courageously submitted their testimonies to the ECCC are elderly women who suffered tremendous losses under the Khmer Rouge regime. They have shown strength and fortitude in the midst of numerous health and psychological pressures to become a part of this historic trial to indict senior Khmer Rouge leaders. Initially with the help of Professor David Kaye and his students at the UCLA Law School, International Justice Clinic, ASRIC successfully submitted these testimonies to the court. 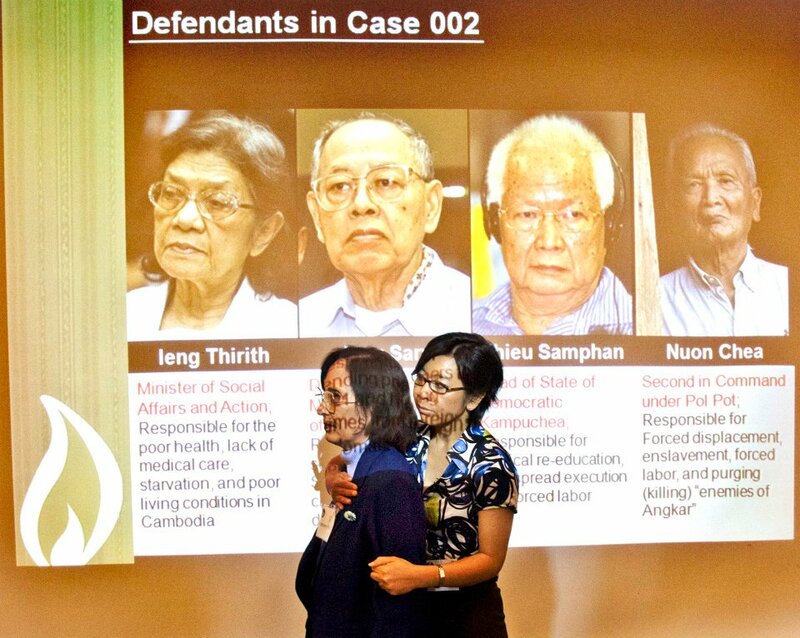 In 2011, all 170 testimonies were accepted as part of the larger body of evidence for the proceedings of Case 002 in which four high ranking Khmer Rouge officials are to be indicted. After submission of the testimonies, ASRIC sought legal representation from the Center for Justice and Accountability (CJA) who will advocate for the participatory rights of the survivors in case 002. As part of the healing process and the quest for justice, ASRIC also works to support survivors to travel to Cambodia and participate in the proceedings of the tribunal. Most recently, ASRIC has initiated the Art as Witness program, which involves intimate workshops in dance, song, and visual arts. Facilitated by ASRIC’s Founding Executive Director, Dr. Leakhena Nou, and artist‐in‐residence Prumsodun Ok, the program allows community members to share stories of struggle, survival, and resilience.